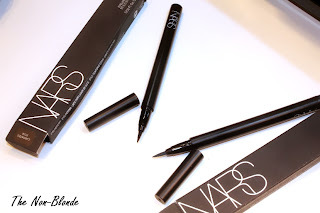 The new formula of NARS Eyeliner Stylo is everything I hoped it will be. Color, ease of application and longevity- they're as good as it gets. The tip of the pen releases exactly the right amount of product, glides smoothly and allows for great control over the width of the line. You can achieve a very graphic look or an understated definition with minimal effort or pressure on the eyelid. 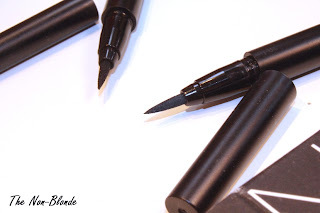 You might remember the previous NARS Stylo version and how disappointed some of us were. Obviously NARS listened and fixed the issues. The pigmentation is NARS-intense and the finish is satiny. As you can see, the black shade, Carpates, has some shine to it, though it's barely noticeable on the lid, at least with moderate application. Atlantic is a perfect navy that offers richness and depth without being too assertive. 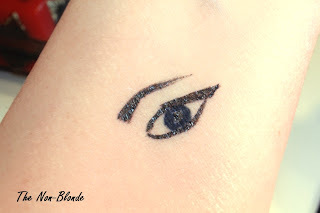 Navy is my favorite eyeliner shade because the way it flatters my skin and brown eyes and the soft effect it creates, especially in harsh light. I've paired Atlantic with several neutral colors, but also played with creating a blue smoky eye with Chanel single eye shadow in Bois Bleu (they're very compatible). 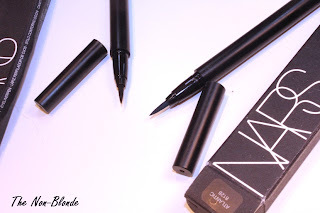 The longevity of the new NARS Stylo is excellent. The press release promises 24 hours and I would not be surprised if that's the case. While this stylo pen is not waterproof, it survives NYC summer humidity without smudging or fading. My eye makeup remains as sharp as I expect it, yet it comes off easily with any decent eye makeup remover. NARS Eyeliner Stylo ($27) comes in four shades (there's also a gray and a brown). Available at the counters and from narscosmetics.com. The products for this review were sent free of charge for my consideration and review.